Crawford, R.M. (1978) The taxonomy and classification of the diatom genus Melosira C. A. Agardh. III. Melosira lineata (Dillw.) C.A. Ag. and M. varians C.A.Ag. Phycologia 17(3): 237-250. Crawford, R.M., Likhoshway, Y.V. and Jahn, R. (2003) Morphology and identity of Aulacoseira italica and typification of Aulacoseira (Bacillariophyta) Diatom Research 18: 1-19. Florin, M.B (1981) The taxonomy of some Melosira species, a comparative morphological study. II. Proceedings of the 6th Symposium on recent and fossil diatoms, Budapest, Hungary. Koeltz, Koenigstein, Germany. Likhoshway, Y.V. and Crawford, R.M. (2001) The rimoportula — a neglected feature in the systematics of Aulacoseira E. Economou-Amilli (ed.). Proceedings of the 16th International Diatom Symposium. Amvrosiou Press, Athens, Greece. 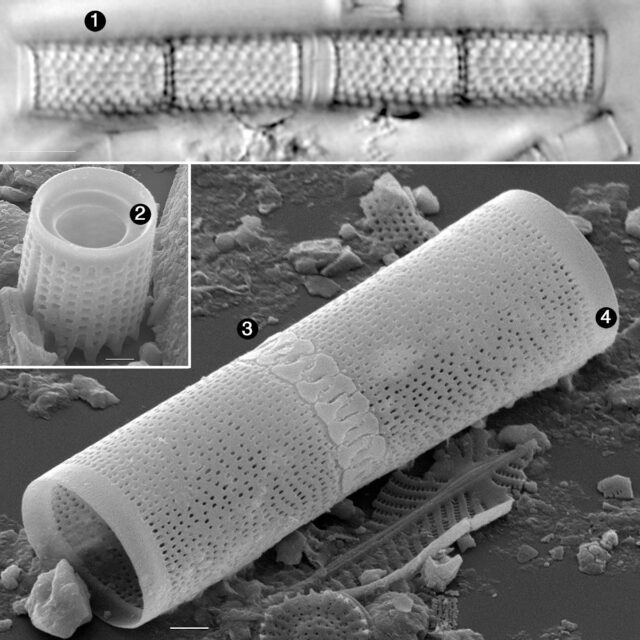 Manoylov, K.M., Ognjanova-Rumenova, N. and Stevenson, R.J. (2009) Morphotype variations in subfossil diatom species of Aulacoseira in 24 Michigan Lakes, USA Acta Bot. Croat. 68(2): 401-419. Siver, P.A. and Hamilton, P.B. (2005) A reevaluation of Aulacoseira nygaardii (Camburn) Camburn & D.F. Charles (Bacillariophyceae): based on scanning electron microscopy of type material Nova Hedwigia 81: 257-265.